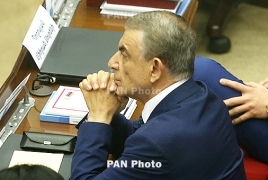 PanARMENIAN.Net - President of the National Assembly Ara Babloyan at a meeting with Egyptian ambassador to Armenia Tareq Ebrahim Mohamed Maaty on Tuesday, July 17 thanked the House of Representatives of Egypt for the work in the process of the recognition and condemnation of the Armenian Genocide. The envoy visited the parliament on Tuesday on the completion of the diplomatic mission. Welcoming the guest, Babloyan the Ambassador for his efforts aimed at the development of the Armenian-Egyptian relations. Weighing in on the historical traditions and friendship between the two peoples, Babloyan stressed the development of cooperation in different areas and called for deeper inter-parliamentary cooperation. Also, Babloyan said he greatly values the balanced position of Egypt in the most important issues for Armenia. The Ambassador said, in turn, that the Armenian-Egyptian relations have become closer due to the Armenian community of Egypt which plays a key role in the development of the country.